Wild Turkey 101 … If I had to choose one single bourbon whiskey for the rest of my life it would inevitably be Wild Turkey 101. Why so? Well, where do I begin? I suppose I could start with the same old reasons you always hear cited: affordability, availability, versatility, and reliability. 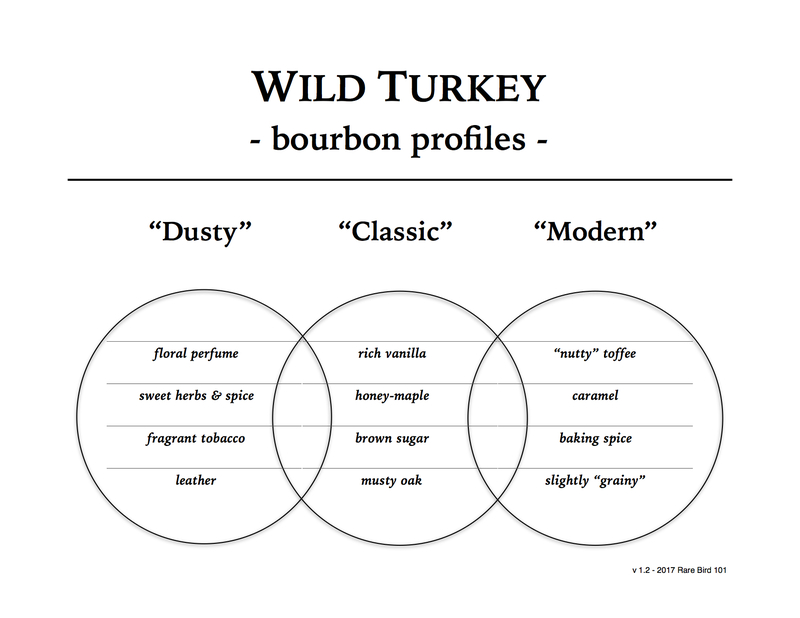 I could easily elaborate on any of these traits and how they relate to Wild Turkey 101. I have before, many others have before me, and many others will likely continue to do just the same. That in and of itself means something. But you know what? I think I’m going to take a different route with this post. Maybe look at things from a slightly different perspective. First, there’s something to be said for a genuine legacy. While there are several Kentucky straight bourbons that share this trait – Jim Beam and Maker’s Mark immediately come to mind – the Wild Turkey 101 that we know and love still rests in the hands of its peerless steward, Master Distiller Jimmy Russell. Sure, there was 101 before Jimmy. But Jimmy’s 101 … that’s the 101 of legend. That’s the 101 we have today. Yes, its profile may have changed (we’ll talk more about profile later), but profiles have changed for all bourbon whiskeys over the years. The most important thing is quality, and personally, 101 has hit a remarkable high in the last few months. Second, there’s something to be said for patient apprenticeship. We all know Eddie Russell as co-Master Distiller of Wild Turkey, but it wasn’t until 2015 that Eddie officially earned the Master Distiller title. It’s not that Eddie didn’t deserve it sooner. Eddie has been producing exemplary expressions of his own design for years. It’s just that Jimmy was deliberately careful (arguably a little tough). After all, Wild Turkey is Jimmy’s Camelot and 101 his Excalibur. The good news is that Eddie can swing that sword like nobody’s business. More precisely, Eddie learned the craft the hard way and spent decades getting where he is today. There’s plenty of “master distillers” out there (every startup has one), but few that have the hard-knocks education Eddie received. Jim Beams’ Fred Noe? Surely. Outside of that … well sadly, that breed of gentleman is few and far between. Finally, there’s something to be said for the underdog. Who doesn’t like a good underdog story? For years Wild Turkey 101 has worn the underdog stigma like a gilded badge of honor – the whiskey of old men, frat boys, and rock stars. Or as esteemed author Fred Minnick says, the “biker bar” bourbon 🙂 . Upon hearing the words “Wild Turkey,” many folks outside of this hobby instantly think “bottom shelf.” The irony is that Wild Turkey has been and remains an incredible high-quality Kentucky straight bourbon whiskey. Let the masses have their Crown Royal and Seven Crown! The way I see it is that it’s simply more Wild Turkey 101 for me and my enthusiast friends. Why do I ask? Well, I suppose this all goes back to last April when Bruce Russell mentioned on Reddit that 2018’s Wild Turkey 101 contained more 10-year bourbon over the typical 8-year bourbon (thanks Longbranch 😉 ). Of course his comments peaked my curiosity and I waited (yes, impatiently) for my local retailers to stock 2018 bottles. The day finally arrived and I immediately got to work. The first 101 bottle I opened was a March 2018 100 ml. This would’ve been filled the month prior to Bruce’s Reddit comments. All said and done, I didn’t find a significant profile difference (at least from memory) in comparison to 2017’s 101. But hold on. This bourbon science project was just getting started. The second bottle I tasted ended up becoming my first “ah-ha” moment … an August 2018 Wild Turkey 101 pint (bottle code beginning LL/GH). Now this seemed special. Not necessarily Russell’s Reserve Single Barrel special (well, maybe the occasional so-so barrel), but remarkable enough to have me thinking twice about what constitutes a “value whiskey.” I proceeded to find a 101 from July (thanks Reid) and September to compare adjacent months. Needless to say they were all strikingly similar and (spoiler) damn good. Before moving on to my notes, I should mention that this post was made possible by a recent Patreon poll. Special thanks to the patrons that voted. You guys & gals are awesome. I hope this review is not only insightful, but meets your expectations. Let’s pour! Overall: Now this is how a quality bourbon whiskey should taste. And at $25 a bottle? Let’s be honest. It’s hard to find anything critical to say about Wild Turkey 101 at that price (especially these late 2018 summer and early fall batches). So what makes these particular Wild Turkey 101 releases stand out over 2017 and early 2018 bottles? Is it the additional 10-year whiskey Bruce Russell talked about? Well, I can’t say for certain that these particular bottles contain extra-mature bourbon, though it wouldn’t surprise me at all. There are, however, other factors to consider. Take for example, the new distillery which opened in 2011. It’s possible that some of the younger whiskey in 2018 Wild Turkey 101 batches was distilled there instead of the old Boulevard facility (as modern NAS 101 is described as 6 to 8 years in age on the reverse label). While everyone loves the allure of old Wild Turkey distillate, there’s absolutely no reason whatsoever that the new distillery can’t produce whiskey that’s even better. Time will tell, though based on the most recent Wild Turkey 81-proof KSBW I reviewed, things sure look promising. Also, I think it’s fair to say that since Eddie Russell was named co-Master Distiller in 2015, Wild Turkey has seen a notable uptick in quality over the last three years. I alluded to this earlier, but please don’t take it the wrong way. I’m not pointing a finger at Jimmy by saying this. I just think the timing is right. Wild Turkey has grown significantly. The operation that Jimmy Russell once oversaw by himself has increased multiple times over. And let’s be frank, Jimmy isn’t getting any younger. Sharing the reins with Eddie was a smart move. Backed by Campari’s investment following a time when the former owner, Pernod Ricard, had essentially let the brand drift … things could only get better. And they very much have. And last but not least, there’s barrel selection. As I’ve shared recently, barrels aren’t pulled from each and every rickhouse year over year. Think of each batching period as a harvest, with barrels pulled from choice rickhouses that are “in season.” It could very well be that the rickhouses from which 2018’s Wild Turkey 101 were batched from are simply of a more favorable profile. I doubt this is a major contributing factor to the notable quality of latter-2018 101 bottles, but it’s a factor worth considering nonetheless. All said and done if you haven’t tried 2018 Wild Turkey 101, what are you waiting for? I highly recommend you give one a try. Hell, buy multiple bottles. They don’t have to be fifths or liters. Just grab a few minis, half-pints or pints of different bottle codes and give them a proper blind tasting. You might just be surprised at what you find. Sure, they’ll each taste like Wild Turkey 101, but I’m willing to bet you’ll find at least one bottle with a special Kentucky kiss. Great write up David. I agree with you and what is interesting is that 2 years ago I would have never paid any attention to WT 101…this has been an amazing turnaround for their hallmark product. Question is can they keep this great run of 101 going???? Any way you cut it……WT 101 is the best “Bang for the Buck” out there! p.s. Once again, great article and review. Keep up the great work! I am always interested in learning more about my favorite distillery. Oh man, I love liquor store scavenger hunts, looking forward to scouring the shelves for late 2018 bottles codes and trying a taste-off with the 2017 bottles I have at home, preferably blind. I am in total agreement with your 101 sentiments – it is one of three bourbons that are mandatory residents on my shelf at home (Evan Williams Bottled in Bond and Old Grand Dad 114 being the other two). My local retailers often have 750 ml bottles of 101 on sale for $19.99; what more could you possible want? Without naming names, I often shake my head as I see bottles that sit near 101 on my retailer’s shelves that are double or even triple that price that don’t come close to 101’s quality and enjoyment to my tastes. Well said and I agree completely. 101 is so undervalued by folks chasing the hype bourbons, yet fervently loved by those that appreciate 101’s quality profile and remarkable value. Thanks for commenting, John. Cheers! Not really a list of codes, just a list of code prefixes. Codes are printed as bottles are filled. So with 2018 bottles, they’ll begin: LL/G, with G meaning 2018. A will be Jan, B Feb, etc. Thanks for the great review. I had almost the exact experience as you report. I saw the Reddit post so grabbed the first 2018 batch I found (Jan. or Feb., I think) I did a SBS with a 2017 batch and, to me, they seemed nearly identical. I recently found some Aug. ’18 and, wow, what a step up! The ’17 is good but, in the ’18, the flavor is deeper, richer and creamier and I pick up some mustiness (not in a bad way) on the nose. I’ve never had dusty Turkey but I’ve heard it had that element. Anyway, I went back and got a few more bottles for $19 ea.+tax. I can’t believe WT can put out a whiskey this good that retails at a supermarket for under $20. Glad you had a similar experience. The core stuff Wild Turkey is cranking out lately is excellent. Glad I’m not the only one thinking that. Cheers! I second your comments. The August 101 is where something changed. Like you, I noticed an immediate “mustiness” on the nose after opening the bottle. Luckily, it was some good ole’ Turkey funk and not bad whiskey, as the taste was better than expected. Definitely a top-notch 101. Best in years! Great timing on this review! I had just left a comment on the latest 101 12 year review, asking, nay, begging for you to review the 2018 101 releases. Sho ’nuff, you delivered! Great review. I’ve been a whiskey drinker for over a decade, and always liked WT. In fact I credit RR10 as one of the “gateway” bourbons for me, where I shifted away from Scotch and more towards bourbon. WT has always been in my top 5 and I always had a 101, RR10, and RRSiB stocked. It was only in the last 6 months that something changed slightly in my taste preference, and I became a card carrying WT cult member. I mean, I always liked it, but now it is THE distillery profile I can’t get enough of. These 2018 batches have been lights out. I wonder if we should bunker these? It seems silly, because they are readily available, but so was 101/12 and 101/8 not too long ago. The comments I read about the aged stocks indicated it was only going to be for a short bit (but who knows, maybe that’s just a marketing bit to get us to buy more WT). Oh, and when able, take a look at the 2018 RB batches. I believe they have older stocks in them as well, and seem notably improved. 2018 was a hell of a year for the Russells! It’s hard to know exactly why – multiple factors to consider. But the good news is, as you’ve mentioned, is that it’s out there. And who knows? Could get even better! Cheers! Good informative review! I was wondering a couple of months ago if it was my imagination of if the late 2018 101 really was better. I’m reassured that you agree! Rare Bird! First – I always enjoy hearing you on Bourbon Pursuit! Okay – maybe only twice? Still, good stuff! Second, I’m new to reading bottle codes and do understand the turkey codes except I’m struggling with the year code and how it aligns with the year it references. It’s early here, I’m not done with my coffee…..help a WT fan out. Thx! Thanks for commenting, Charlie. There’s a code guide here on my site, which also links to a Reddit post that explains in greater detail. When it comes to the modern laser coding, you mainly want to look at the first four letters – more specifically the third and fourth letters for year and month. Thanks again! I just ran out and found 4x 375ml GH bottles. I also grabbed a GJ 750ml. I cracked the GJ and it is musty, toffee, caramel heaven. Drinks like the proof is 80. We really are in the golden age of WT101. I might bunker a few cases for longevity. Thanks for the heads up. I hadn’t bought any 101 other than a few minis in the last 2 years. I might be done chasing unicorns. Why should I when I can get Lawrenceburg Gold for 19.99$! Amen Mike! And thank you for commenting and sharing your thoughts. I truly appreciate it. How do we date the mini 50ml bottles? Modern-era minis have the same codes from my experience. Occasionally, you’ll have a bottle with the code missing. Thanks for the great review. I’ve been a WT 101 fan since Thanksgiving 2012 when my dad brought a handle to our house to celebrate the holiday! Funny how it led me on the bourbon appreciation trail (trying numerous other brands/proofs) but I seem to always return home to the kickin’ chicken as Jimmy says … Best bourbon out there, especially for the price! Will have to grab some late ’18 vintage, to see how they may have improved the “unimprovable!” Thanks again for the reviews and great information. Thanks Todd. I appreciate you commenting. Be sure to let me know what you think when you pick up a 2018 bottle! David, thanks so much for the review. It came just in time! After doing a Russell’s pick with Eddie yesterday, I was able to snag an LL/GI 750 from the gift shop. Looking forward to tasting that one alongside one of my earlier bottles. Awesome! When you do, please let me know what you think. David, Jason from the “Mash and Drum” was over today and we were able to taste the LL/GI side by side with an older 2015 liter I had laying around. It was a nice surprise. The nose on the 2018 stood out and brought back fond WT memories (not mentioning my age). The palate was more rounded with a wonderful buttery-toffee-spicy sweetness joining in the mid palate and carrying though to the finish. I kept reaching for the LL/GI till it was gone, but finished the 2015 as well. Both are delicious, but the late summer, early fall 101’s are a little special. Thanks for letting us know! Anytime! Thanks for sharing your thoughts. I’m a big fan of Mash & Drum! David, am I safe in assuming something bottled in November ’18 would be of comparable age as the July, August, September that you tasted for this review? I was in the right place at the right time today when I walked into a store to kill 10 minutes and walked out with a handle of 101 that cost me $30. We turkey heads sure are spoiled with the availability and price of this stuff. I haven’t had November yet – but – 101 is always a quality buy! My sense is GG to GJ all have 10 year old. A store near me only had GK. So going to another. Hopefully the quality will stay high through 2019! Thanks for the awesome content. I saw that Eddie commented on Reddit that the older stuff made its way into 2018 Rare Breed too. Have you had a chance to try any summer/fall-2018 Rare Breed to see if it was noticeably different? I believe that was Bruce, but yes. And it’s fantastic! I tried an LL/GG. What Rare Breed codes should we be on the lookout for? As for 2018 I’ve only had LL/GG and it’s delicious! David, awesome article, I absolutely love Wild Turkey 101. The minute I got home I looked at a couple of bottles that I had not opened yet and one was a LL/GH and the other was a LL/GK, I can’t wait to sample these. Is it safe to say by reading your article that the July, August, and September will all be the same quality. Do you think months after that are also great? Chuck, thanks for reading! I haven’t tried any bottles after Sep yet, but WT 101 is always a deal. Not much risk in trying and buying – especially with half pint and pints readily available. Go for it and let me know. Cheers! Chuck, have you compared the GH and the GK to see if the GK has some 10 year old in it? I got a GH and can definitely tell a difference. Lots of GKs in my area but I have not bought yet hoping to hear from someone else their finding. Thanks. I had a July one. Fantastic. My liquor store owner also mentioned how great it was compared to the older version. In the last few days I found some LL/GG and LL/GH pints, and some LL/GI 750s on sale. Gonna stock up and bunker while I can. Can’t hate on delicious, available, and affordable bourbon. Nope. Can’t hate on that! Hopefully, the trend will continue – maybe get even better?! curious if you think these are worth chasing to bunker or if you feel the standard 101 only warrants buying what’s available when its available? i know it may seem silly to bunker given the price point but i’ve only really been drinking Turkey and 101 now for about 5 years and this latest LL/G batch is the best ive had so ive got 2 stashed away. Personally, I’m not bunkering modern 101. Drink, yes. Bunker, no. I have only so much room in my cabinets and most goes to dusty WT or RRSiB. That said, I completely understand why some folks would and fault them not! Just tried a GA vs a GJ. The GJ was preferred. Lots of toffee and caramel and more balanced. The GJ abs GI bottle are disappearing. I’m seeing bottles with H codes now. What does that mean? Tom, Glad to hear this. It seem most months through the end of the year are probably good. I wonder if anyone had had anything from 2019. So where I live we only have county stores. In the 750 ML I can only find GE café which no one has reported on yet. But I found a 375 ML size today with GH. I must admit I have only had wild Turkey 101 from a bottle last year and finished it earlier this year. I thought it was good in mixed drinks because of the proof but I personally found it a tad harsh to either drink need war with one or two rocks. I just tasted a small amount of the GH I just bought and while I am no expert I can definitely tell that is smoother with practically no bite. I have a bottle of Hudson baby bourbon which cost me $50 and is not half as good as the one I just bought. Unfortunately they only had the one bottle. I would’ve bought more even though it was more expensive than the 750 ML size. Hopefully someone will try the GK and report back as to what they found is compared to earlier versions they may have had. The clerk in the store could not understand why I was looking at codes and I explained it to him so he understood. So is J (GJ) the last letter of the year? The first letter after LL/ is the year. So LL/H would be 2019. The fourth letter, or second after LL/, is the month. So LL/HA would be Jan 2019. LL/GJ would be G-2018 and J-would be October.